The words were written by Rev.A.L.Luker (Anglican Priest) an Englishman living in Guyana and a Guyanese musician Mr.R.C.G.Potter set the poem to music. Green Land of Guyana,our heroes of yore Both bonsmen and free,laid their bones on your shore; This soil so they hallowed,and from them are we All sons of one mother,Guyana the free. Great Land of Guyana,diverse though our strains We are born of their sacrifice,heirs of their pains And ours is the glory their eyes did not see- One land of six peoples,united and free. Dear Land of Guyana,to you will we give Our homage,our service,each day that we live God guard you,great Mother,and make us to be More worthy our heritage-land of the free. 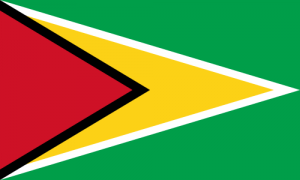 I pledge myself to honour always the flag of Guyana,and to be loyal to my country,to be obedient to the laws of Guyana,to love my fellow citizens,and to dedicate my energies towards the happiness and prosperity of Guyana.